Once upon a time there was a giant. . .
Sal Tangit was the last living giant. that didn't have a spare bed. Both shared a love for books. 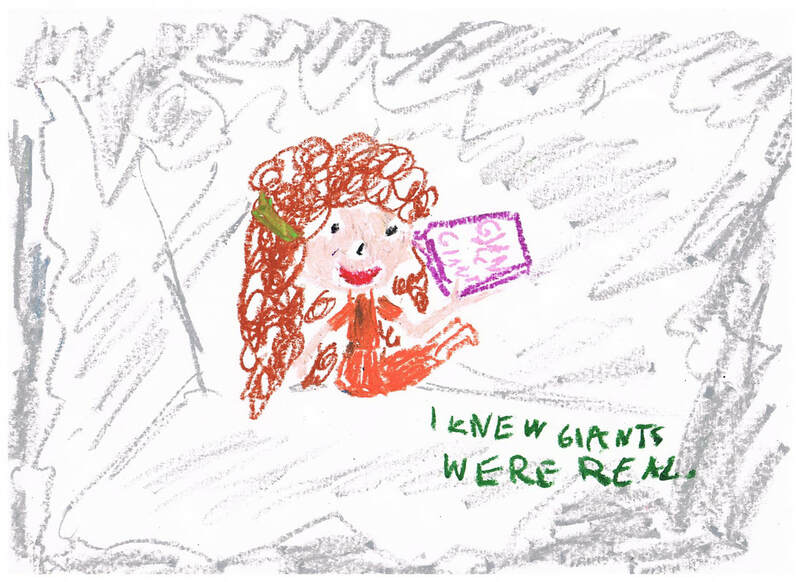 The Giant Bookworm is a fantasy novelette for ages 8 and up. The 14-part serial was published from May 2014 to June 2015 in Approach magazine Thailand. Download the PDF file below to read an excerpt. Amelia picks up lots of interesting words in all those books she reads. In alphabetical order, here are some of the words she has used and their meanings. Provide lodging or room for. A state of utter confusion. Abandoned, discarded item, especially clothing. The curved line you draw to make a circle. Awake, aware, knowing, or recognising the truth. Reject something no longer useful or wanted. Piece of personal property that has been in a family for several generations. Sitting Room in a house. A vertical or steep face of a rock, mountain, cliff etc. Regret, feeling bad for a wrongdoing. Search for something, usually with haste, among other things, and making a mess in the process. Woman whose husband has died and has not remarried. Sal is the last giant and a collector of books who longs to be able to read the tiny markings humans call 'letters'. He lives in the valley east of Reckwood, something his human neighbours fail to notice until he visits them in the night and steals the library attached to the Orphanage, accidentally kidnapping an orphan sleeping soundly inside. That orphan's name is. . . Newly orphaned Amelia is sent an overcrowded orphanage in Reckwood, a village backed by mountains and far from everything and everyone Amelia has ever known and loved. To escape her sadness, Amelia dives into her imagination and the worlds she finds in books. Madame Cole is the school teacher at Reckwood, and lives at the orphanage. She is rather disliked by each and every child under her care for generally being the most mean adult they have ever met. Orthella, who prefers to be called Ella, is another child living at Reckwood orphanage. Adam is Sal's deceased brother, whose voice Sal sometimes hears in his mind. Amelia's Mama worked as a nanny, taking care of Lord and Lady Beacon's children. Many of the items in Amelia's home were the Beacon's castoffs. Lucida Better is the housekeeper/cook/guardian at Reckwood Orphanage (although, honestly, most of the housework is done by the children). June married Amelia's uncle (her father's brother) which makes her Amelia's Aunty. Because Amelia's father and his brother were estranged, Amelia didn't know she still had family in the world. for it's hidden meaning. Can you guess what it is? Here's a hint: Sal Tangit is an anagram. That means you can rearrange all the letters to make a new word, or in this case, 2 new words. Can you discover the words hidden in Sal's name? SAL TANGIT = ???? ????? 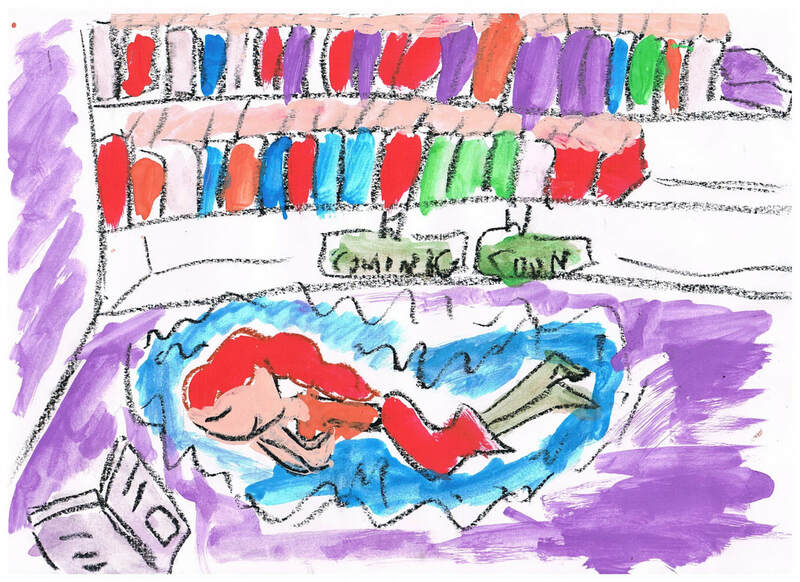 The illustrations featured on this page was created by Miaow, a talented young local artist and winner of 'The Giant Bookworm Artwork Competition'. Her winning entry, 'Amelia in the Library' (above) featured in the Approach magazine Thailand, issue 24, Jan 2015. Thank you Miaow!